The International Conference on New Media, Communication & Technology (INCT) is organized by the collaboration of 3 universities including Faculty of Communication Arts Chulalongkorn University, Faculty of Journalism and Mass Communication Thammasat University, and School of Communication Arts and Management Innovation National Institute of Development Administration, where scholars and their students had generously shared their thoughts on academic knowledge. 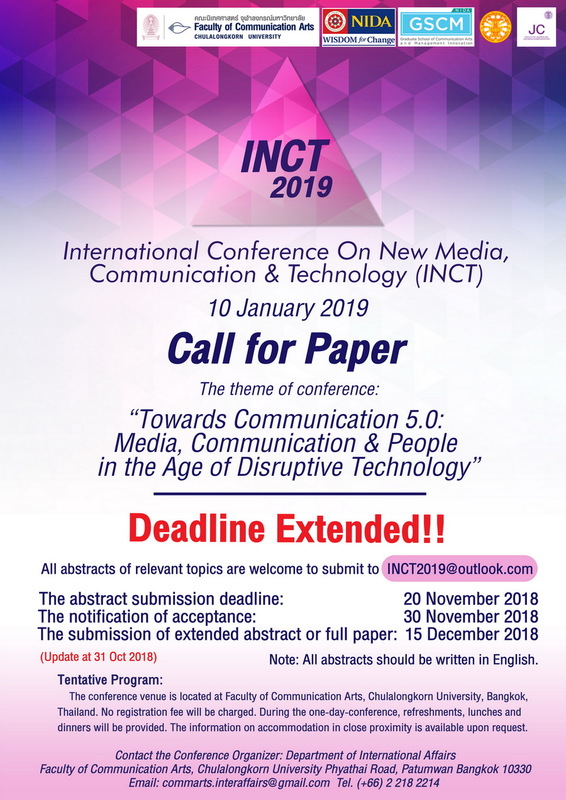 In 2019, the 1st INCT will be held at Chulalongkorn University in Bangkok, Thailand. According to the theme of the conference “Towards Communication 5.0: Media, Communication & People in the Age of Disruptive Technology”, the general theme focus on discussing perspectives on communication in the age of disruptive technology. The 1st INCT invites academic scholars from different interests and backgrounds to present on and discuss the finding from theoretical concepts and justification to application. Note: All abstracts should be written in English within 300 words. The conference venue is located at Faculty of Communication Arts, Chulalongkorn University, Bangkok, Thailand. No registration fee will be charged. During the one-day-conference, refreshments, lunches and dinners will be provided. The information on accommodation in close proximity is available upon request.